This is the simplest chicken recipe you can make. If you want to play with the flavors, add lemon segments, halved heads of garlic, or chopped fresh herbs inside the cavity and under the chicken skin. Round out the dish with a serving of creamy low-lactose mashed potatoes. 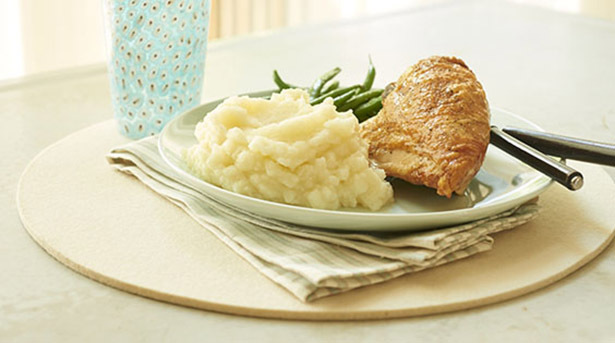 The secret to the success of the mashed potatoes is using a Foley food mill or ricer. It is what makes the potatoes amazingly fluffy. To prepare chicken, preheat oven to 450°. Place chicken in a roasting pan, making sure the gizzards are removed. Using paper towels, pat chicken dry. With breasts facing up, drizzle olive oil over chicken. Using your hand, spread olive oil all over the skin and generously season with salt and pepper. Place in oven and cook 45-50 minutes or until internal temperature of chicken reaches 165°. Remove from oven and let rest 10-15 minutes before carving. Serve with Low-Lactose Garlic Mashed Potatoes. To prepare mashed potatoes, peel and chop potatoes. Remove garlic from paper skin. Combine potatoes and garlic in Dutch oven or large saucepan and cover with water. Bring the water to a boil over high heat, reduce heat to medium, and cook 10 to 12 minutes or until potatoes are tender. When potatoes are tender, drain in a colander. Push potatoes and garlic through a ricer to make them extra fluffy. Return pan with riced potatoes to stovetop and cook over medium-low heat. Add half of butter. Stir until butter is melted. Add half of milk. Stir until milk has been absorbed. Add remaining butter and let stand until butter melts. Add remaining milk. Stir well, and season with salt to taste. Serve immediately.